Directly on the seafront, and hidden on a secluded beach, Amari Phuket offers you a prime location in Patong’s southernmost corner surrounded by the Andaman Sea. The resort is conveniently set within a 5-minute walk to Patong Beach while Phuket Town and the island’s popular attractions are easily accessible from our resort.With sun, sand and fun just steps away - you will never have a dull moment at Amari Phuket. The resort offers a full range of recreational facilities and services including three swimming pools & Breeze Spa.Discover vibrant flavours in spectacular settings. With a range of bars and restaurants to fit your tastes and moods, Amari Phuket is home to some of Phuket's finest dining options. They are the stars of the sea. Star Clipper and Star Flyer are as fleet as the wind and as graceful as swans.These are true clipper ships reflecting their proud heritage in every inch of their polished brass and gleaming brightwork. Step aboard these unique vessels and discover a new age of sail, where the traditions of the past are happily married to the comforts and amenities of the present day. Star Clipper and Star Flyer are modern cruise ships in every way, created for luxury-loving passengers who also love the traditions and romance of the legendary era of sailing ships. Star Clipper and Star Flyer are both 360 feet long and each carries just 170 guests in pampered comfort. Life aboard is blissfully relaxed, much like traveling on a private yacht. You’ll never feel confined on Star Clipper or Star Flyer. Each ship offer spacious accommodations and expansive teak decks with ample space and not one, but two swimming pools. In fact, you’ll find that these ships offer more outdoor space per passenger than most conventional cruise ships. 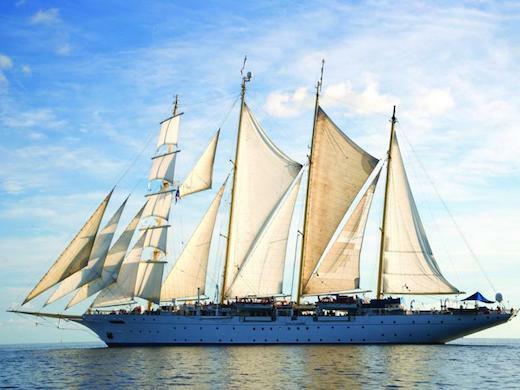 The décor of Star Clipper and Star Flyer is reminiscent of the grand age of sail. Antique prints and paintings of famous sailing ships please the eye, while teak and gleaming mahogany rails are richly reminiscent of Star Clippers’ proud nautical heritage. Let us start with the bright and airy rooms - soft beds that you'll sink into, plush pillows that'll make you want to snooze, day-bed to watch DVDs from and a private balcony to sit and chill while you take in the view. Imagine being by the pool, gazing out to the calming sea or snorkelling in crystal clear waters at the Jetty, with schools of colourful fish and coral reefs inviting you to play.